As enjoined by the Qur'an, is to "Establish prayer and give zakah and bow with those who bow [in worship and obedience]." A dual mission for educating both Muslims and non-Muslim in an attempt to counter distortions and misconceptions about Islamic beliefs and practice. To demonstrate the Islamic origins of modern values like the rule of law and sciences. To promote Islam as a source of enlightenment and to promote those values that bring about a healthy society. Burnaby Mosque Land is purchased in 1998. The Burnaby Masjid opened its doors while it was still under construction. Burnaby has been the leader in establishing a new role for Mosques in our lives. 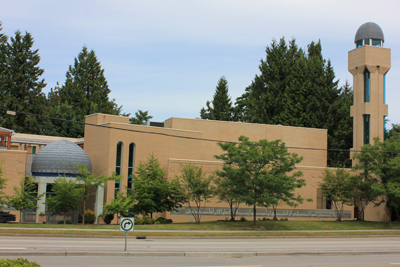 Not only does the Burnaby branch hold regular prayers in the Mosque, but Arabic lessons for children, adult education, public seminars for non-Muslims on Islam, lectures on health, movie screenings on Islam and related matters, a library and laptop computers are available at this modern Masjid. As well, plans are underway to add fi tness equipment. The association is also raising funds for a minaret. Burnaby is truly a Mosque for the 21st century.